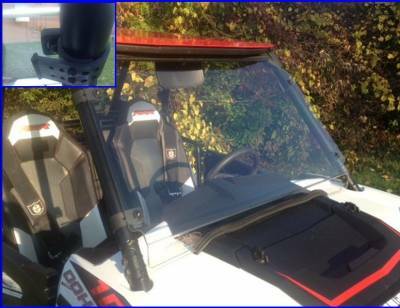 RZR XP1000 Hard Coated Full Windshield with Fast Straps Fits: 2014-16 RZR XP1000, 2014-2016 XP1000-4, 2015-16 RZR 900, 2016 RZR 900-4, 2016 RZR 1000-S Made from 1/4" Thick MR-10 Hard Coated Lexan (Polycarbonate). Attaches with our patent pending rubber "Fast Straps". Rubber mounting straps will not rust or rattle. Bottom seal protects your hood. DOT-rated and stamped. Made from 1/4" thick hard coated MR-10, this is probably the last windshield you will ever buy for your RZR XP1000. It features our "Fast Straps" so you can easily remove the windshield without any tools. Simply unhook the rubber straps. Rubber straps will not scratch your cage. DOT rated and stamped.